Aims of primary treatment of wastewater is to separate suspended solids and greases from wastewater. What does primary treatment of wastewater remove? Sedimentation remove both organic and inorganic suspended solids. In addition, skimming, as part of sedimentation tank, remove grease, oil, scum, and floating solids. In earlier posts, we learned sources of wastewater, which are domestic wastewater, industrial wastewater, and infiltration/inflow. In this post, I want to share to you how wastewater is treated. Where does wastewater come? This basic question shall be answered if we want to design a wastewater treatment system. Source of wastewater, its characteristics, and its flow rate, will influence the type of technology to treat the wastewater. Domestic (also called sanitary) wastewater. This type of wastewater is discharged from residential districts, commercial districts, institutional facilities, or recreational facilities. Industrial wastewater. Wastewater which predominantly consists of industrial waste. Infiltration is water entering a sewer system including service connections, defective pipes, pipe joints or manhole walls. Inflow is the water discharged into a sewer system from roof leader, cellar, yard and area drains, foundation drains, cooling water discharges, drains from springs and swampy area, manhole covers, cross connections from storm and combined sewers. After a quite long absence of updating this blog, I want to begin this March’s post with refreshing our knowledge about wastewater treatment. Let’s begin with one fundamental question: what is wastewater treatment? 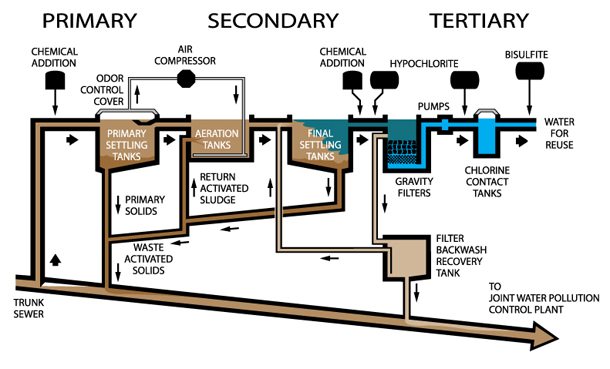 In general, wastewater treatment is a process converting wastewater into effluent that can be discharged back into the environment. This terms contains at least four keywords, which are wastewater, effluent, converting process, and environment. I think this is my first time I learnt about Upflow Anaerobic Sludge Blanket (UASB). I’ve ever learnt about anaerobic wastewater treatment, however I don’t have any idea about UASB and what the differences are. Since I am responsible as engineer in wastewater treatment package, I need to learn about UASB (there is a possibility that this system will be included in the package). A few weeks ago I got a discussion about wastewater treatment system in our proposed plant. I discussed with one of my colleague. He said, “Let the nature works! Let it process the wastewater by itself”. It sounds weird at the first time. But he’s right and he’s a bit wrong.